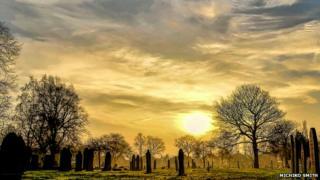 This year's Halloween has been the warmest on record in the UK, BBC weather has said. A temperature of 23.6C (74.3F) was recorded in Gravesend, Kent and Kew Gardens, Greater London, surpassing the previous record of 20.0C. Other parts of the south of England and the north coasts of Wales and Norfolk also broke the 20C mark. The previous record was set in Dartford, Kent, in 1968 and matched in parts of Greater London in 1989. At 12:20 GMT, the Met Office tweeted: "Charlwood has beaten Filton, recording 22.5C. This makes it the warmest #Halloween on record!" Less than an hour later, it tweeted: "The warmest #Halloween on record has been broken again with Gravesend recording 23.5C." Nine out of the 10 months so far this year have been warmer than average, BBC weather's Emma Boorman said. "Temperatures are not set to stay like this. They will fall away over the weekend dropping to the seasonal norm," she said. The UK mean temperature for October so far is 11C, which is 1.5C above the long-term average between 1981 and 2010, but short of the 12.2C record set in 2001.